with top plate removed, you can see thrust action keys. the finished version is ready for use. 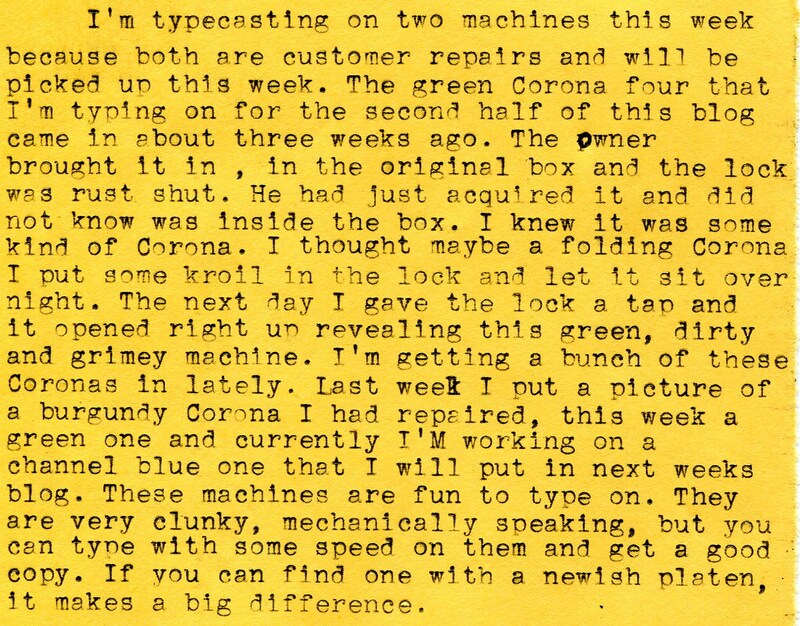 This Corona is in great shape and ready to type. More wonderful stories. Those two machines look gorgeous now! I've admired Klein-Adlers from a distance (online) but haven't gotten one ... yet. Tom: Great that you are helping others to add another chapter to some venerable machines. You ever come across fresh ribbon (or a good workaround) for the Klein Adler, please let me know. Richard: There's one going for a song on uk ebay. Top plate nut missing. Ha! How alike people are! I bring my Saab 9000 into my dealer for repairs and find him driving the thing around town! (oh, just to test it out -- he says!) So, there you are sneaking a ride on customers' machines! Martin- Lets just call it the perks of the job! Rob- The Klein-Adler uses a 3/4 inch ribbon. I got a one inch ribbon for a time clock and cut it down to fit the ribbon spools. Only took ten minutes to do. Great stuff, as usual, Tom. I sure wish I could browse your shop in person. 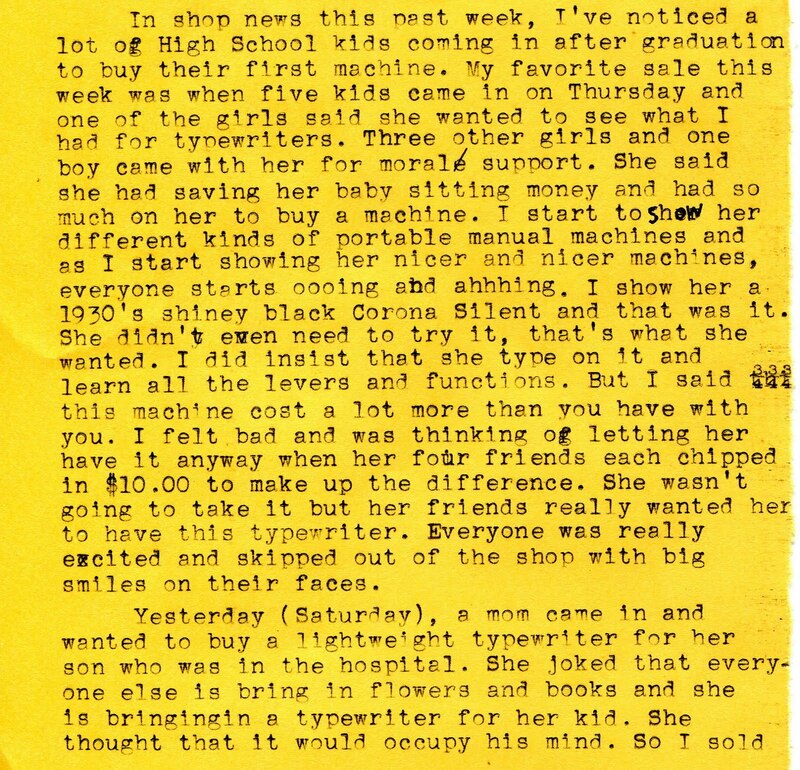 Hey, I emailed you a link to an article about 3 typewriter shops in the San Francisco Bay area. It's packed full of photos of some nifty typewriters, one is even see-through! 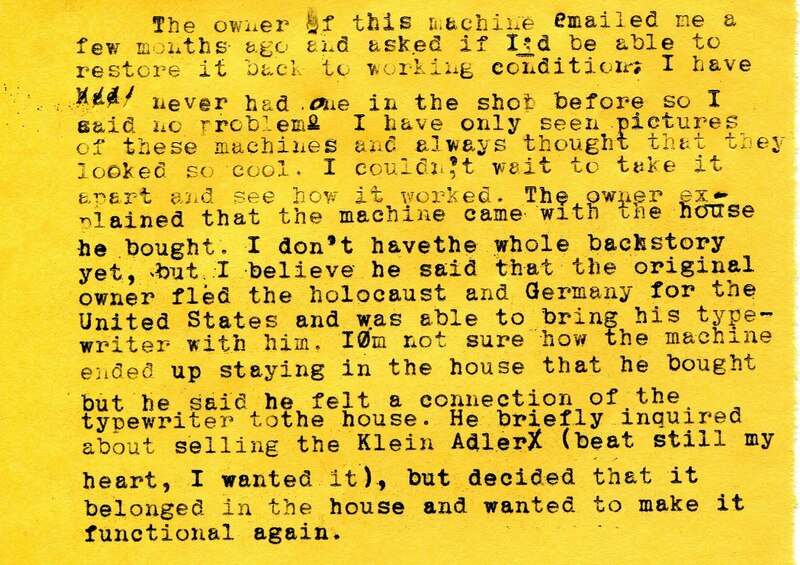 Don't know if this comment will allow for links, but here goes: http://www.wired.com/rawfile/2010/05/gallery-typewriters/all/1. I'm sure it would be of interest to your readers as well.